Ice dams are among the many issues that plague households during winter. That said, these bring many little problems that can add up in terms of costs and expenses. For that alone, these require your attention. Though ice dams form on the edge of your roofing in Evergreen Park, IL, the reason water gets there is the heat escaping through your roof. The main reason that happens is old, inefficient materials. Poor ventilation also contributes, however. Be sure to call Rogers Roofing for repair services. Another long-term solution would be our replacement metal roofing. Not only does this material regulate heat transfer and mitigate heat loss; it’s also durable. We offer Leaf Relief gutter protection here at Rogers Roofing. These keep ice dams from forming within your gutters. These also protect the vulnerable wooden fascia that holds your gutters in place. Water from the ice dams can seep into that small space between gutter and fascia, where it can infiltrate the water and cause rot to form. At the core of problems with ice dams is inefficient heat regulation in your home. With our windows in Hammond, IN, from both Marvin Windows and Great Lakes Windows, heat stays within the home. This ensures comfort and warmth without the use of artificial heaters that can cause ice dam formation. Replacing your old windows with any one of the many styles we offer will go a long way towards your comfort and protection. 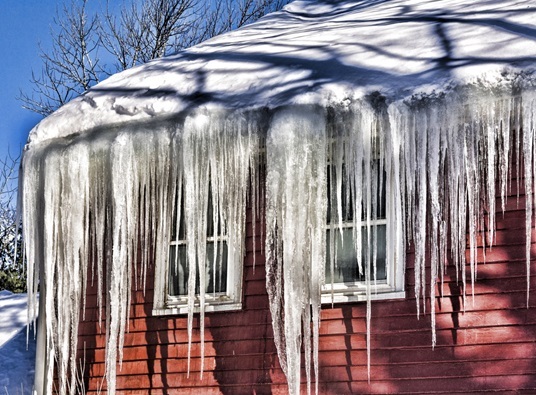 Ice dams are avoidable if you just get your home ready for the winter. Best of all, the ideas we will beneficial in the months to come. Get in touch with Rogers Roofing today and we’ll help set your home up with quality home improvements.